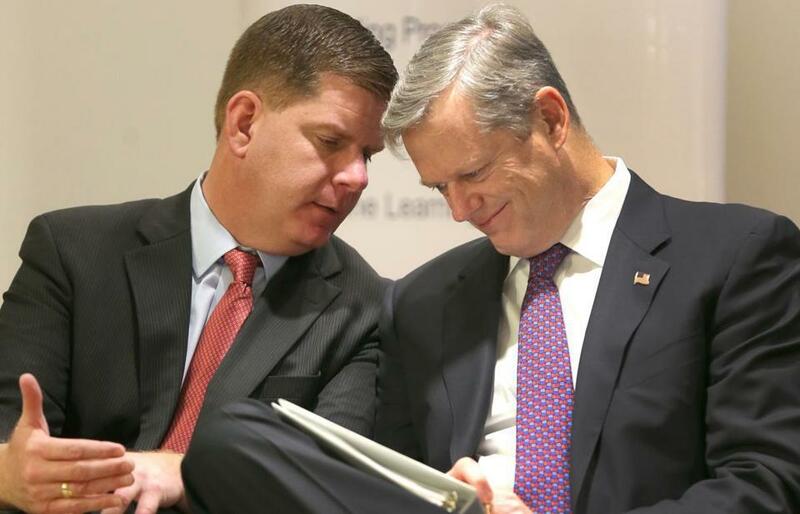 Boston Mayor Martin J. Walsh (left) and Governor Charlie Baker. A triumvirate of the most powerful politicians in the state is teaming up in an all-out effort to stop a likely November ballot question that would legalize marijuana for adult recreational use. Governor Charlie Baker, Mayor Martin J. Walsh of Boston, and House Speaker Robert A. DeLeo are set to announce Thursday that they are launching an anti-legalization campaign that also includes a coalition of doctors, law enforcement officials, and addiction specialists. 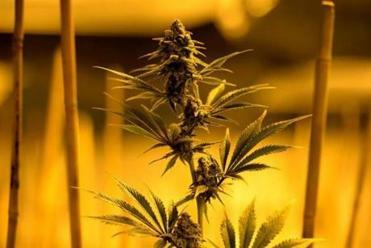 The push will warn that approving the measure would increase marijuana use among youths. The newly formed opposition group — the Campaign for a Safe and Healthy Massachusetts — sets the stage for a bitter and expensive battle this fall. Deep-pocketed national pro-legalization forces have for years been planning the Massachusetts referendum campaign, which would legalize marijuana for those 21 and older, and allow retail sales beginning in January 2018. They are expected to gather enough signatures to win placement on the ballot, and they have a record of spending many millions of dollars to convince voters in states such as Colorado to support legalization. But Baker and the other two political leaders, aides say, have committed to raise money for the anti-marijuana effort and make public appearances arguing against the initiative. The state could become home to a $1.1 billion cannabis industry by 2020, according to a report. Any political campaign needs money to succeed, but it’s not yet clear where the new committee’s cash will come from. Jim Conroy, a top political aide to Baker who is a key adviser to the anti-legalization campaign, declined to say whether there are people or entities that have already committed to financially backing the new group, which can raise unlimited sums of cash. Another key adviser to the campaign is Corey Welford, who served as Attorney General Maura Healey’s chief of staff until earlier this year. Healey, too, opposes legalization but is not part of this group. Even with so many top politicians lined up against legalization, it’s still not certain whether that will sway public opinion. A February UMass Amherst/WBZ poll of registered Massachusetts voters found 53 percent would vote yes on a legalization question, while 40 percent would vote no. Seven percent were not sure. In Colorado, voters passed a 2012 measure to legalize and tax marijuana 55 to 45 percent, despite the opposition of Governor John Hickenlooper and other political leaders, who worried about more children using drugs. Proponents there effectively argued that it made more sense for money spent on marijuana to go to the public good than to cartels. Supporters of the proposal insist legalization would be a net positive for Massachusetts, as they say it has been for Colorado, where retail marijuana sales to people 21 and older have been legal since 2014. The proponents say legalization in Massachusetts would swiftly begin to phase out illegal marijuana sales and end a system that they say has ensnared otherwise-law-abiding citizens in the criminal justice system. Further, they argue that a legalized marijuana industry would raise new tax revenue and improve the health and safety of children by moving marijuana sales from the street to licensed stores that rigorously check IDs. The anti-legalization campaign, on the other hand, will argue two major points, Conroy and Welford said. First, they assert if the drug is legalized for adults, kids will end up having greater access to marijuana and use more of it, which, they declare, will be detrimental to young people’s health and well-being. The campaign will point to Colorado, where regulators have struggled with edible products — the marijuana infused candy, cookies, and colas that often look identical to their non-pot equivalent and can be appealing to kids. And they’ll trumpet a federal drug-use survey that found Colorado has the highest youth rate of marijuana use in the nation. Second, the anti-legalization group will say, the ballot question is crafted to benefit the marijuana industry, not public health and safety. They will emphasize that this state has already legalized marijuana for medical use and replaced the criminal penalties for possession of 1 ounce or less of marijuana with a system of civil penalties — doing away with many criminal justice concerns. The proposed law would create a “Cannabis Control Commission,” with members appointed by the state treasurer to oversee marijuana stores, cultivation facilities, testing facilities, and manufacturers of edible products like pot-infused cookies. And the measure would impose a 3.75 percent excise tax on retail marijuana sales, in addition to the state’s 6.25 percent sales tax — and it would allow cities and towns to levy an additional 2 percent tax that the municipalities could keep. The ballot committee supporting the legalization effort, the Campaign to Regulate Marijuana Like Alcohol in Massachusetts, is backed by the Marijuana Policy Project, a national group that has had success at legalization in other states. Voters in Colorado, Washington, Oregon, Alaska, and the District of Columbia have legalized the recreational use of marijuana; a similar measure failed in Ohio last year. The drug remains illegal under federal law. Joshua Miller can be reached at joshua.miller@globe.com. Follow him on Twitter @jm_bos and subscribe to his weekday e-mail update on politics at bostonglobe.com /politicalhappyhour.